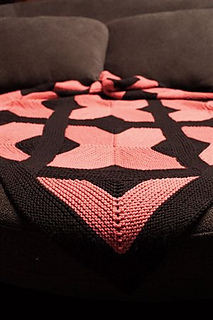 This knit blanket is a cool combination of two-colors, garter stitch, and mosaic knitting. 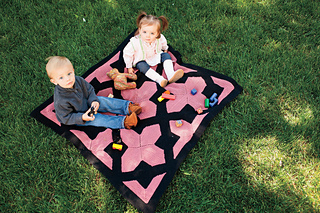 The blanket is built from thirteen individual triangles that are built upon until the blanket is completed. A garter-stitch border brings it all together. Choose two highly contrasting colors to make a showstopper! -Finished Size: 42 1/2” square. -Yarn: Valley Yarns Valley Superwash (100% extra fine merino; 97 yd [89 m]/1 3/4 oz [50 g]): #436 wild rose (MC), 9 skeins; #220 black (CC), 10 skeins. -Needles: Size 8 (5 mm) straights and 40” circular (cir). Adjust needle size if necessary to obtain the correct gauge. -Notions: Markers (m); tapestry needle. -Gauge: 15 1/2 sts and 32 rows = 4” in garter st; one Triangle A measures 11” wide and 5 1/2” tall.